Circa Ivy Prince Daylesford features 1 bedroom and 1 bathroom. 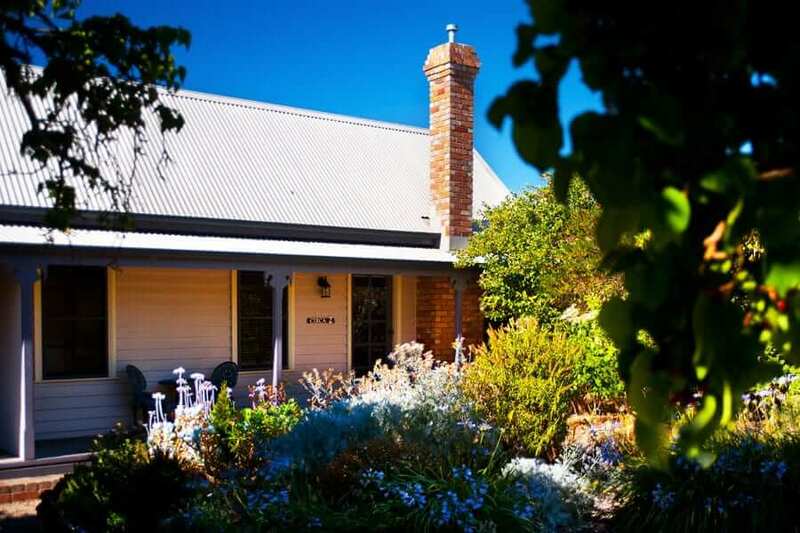 This cozy cottage is perfect for a luxury getaway in the heart of Daylesford. Quietly sophisticated cottage situated in the town centre. 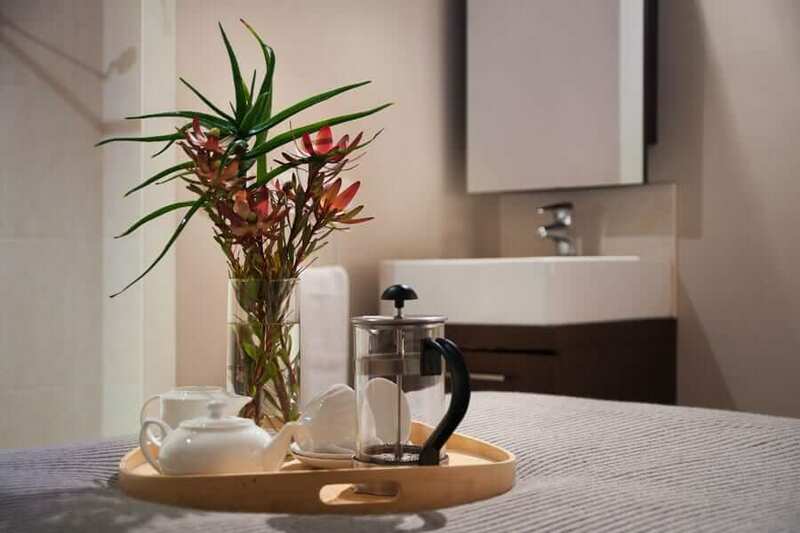 With one bedroom and one bathroom, Circa Ivy Prince is perfect for couples, though it can also make for a great solo holiday. Like its neighbour properties, Ivy Prince’s interior is split evenly between an open-plan living and dining area, and the bedroom with its en-suite. The kitchenette and dining table are just adjacent to the lounge, with the fireplace to provide warmth while cooking, eating and relaxing. Large windows and plentiful natural light lend the space an open feel, while artworks adorning the walls add character. The bedroom boasts an elegant, canopied queen bed and yet more beautiful artworks. Simply furnished with nightstands and a TV, this room provides comfort without frills. The adjoining bathroom has a spa, perfect for a relaxing night in, and a large shower. Along with the gas log fire, split-system heating and cooling help to keep the home at the perfect temperature whatever the weather. One of three semi-detached cottages, this property can also be booked alongside its neighbours for those looking to stay in Daylesford as a group, offering both proximity and privacy. Tucked away in an intimate garden, Ivy Prince provides a peaceful country retreat with the bustling heart of Daylesford within walking distance. Restaurants, curio shops, clothing stores, pubs and more await exploration. Venture out and discover the beauty of country Victoria, with Lake Daylesford and the Wombat Hill Botanical Garden both nearby. The Ivy Cottage is a fantastic place to stay, especially for a couple. It’s beautifully styled and the bath is lovely. Being located so close to the Main Street and being able to walk wherever we needed to was a real benefit. Would definitely recommend to others and would love to return again! What a delightful weekend! We knew the property was gorgeous but we didn’t realise just how perfect it was! The unit was so cosy and clean. LOVED the fireplace and the bed was heaven, we could of stayed for weeks! Theresa and Sam were extremely helpful and prompt with their reply, thank you for having us stay! Super clean and stylish little cottage! The host was very good at communicating and a lovely platter of treats were left upon our arrival. Close to everything and super quiet at night to get a good night sleep! Will definitely return one day! Thank you! You may be interested in our other properties – See what Georgie Gardens has to offer your next vacation, or check out the magnificent Kate’s Place, or browse our other luxury choices in Daylesford accommodation.